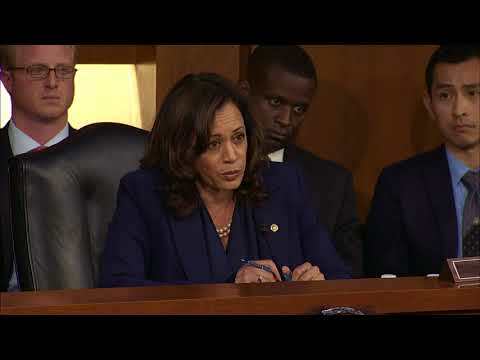 WASHINGTON (AP) — Sen. Kamala Harris put Supreme Court nominee Brett Kavanaugh on edge with a surprise question at his confirmation hearing on whether he spoke with anyone about the investigation into Russian election meddling. It’s the only time President Donald Trump’s high court pick appeared to stumble. The California Democrat, who’s considering a presidential run, pressed Kavanaugh late Wednesday as the hearing wound down to tell her who, if anyone, he’s spoken to at a law firm about special counsel Robert Mueller’s investigation into contacts between the Trump presidential campaign and Russia. Kavanaugh seemed perplexed at first, then said he couldn’t think of any such conversations and repeatedly asked to see a list of lawyers who work at the firm. Harris said he doesn’t need to see a list to recall whether he’s talked to anyone at the firm in the 15 months since Mueller’s probe was launched. Mueller is probing whether Trump or any of his associates were aware of Russia’s efforts to influence the election and whether Trump obstructed justice. Harris is one of several Democrats concerned about Kavanaugh’s view of whether a sitting president can be indicted.